"I came up with this recipe when I didn't have any beef in the house. 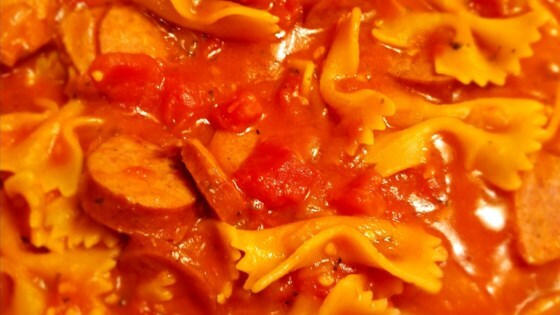 Kielbasa simmered in a tomato sauce with bow ties. It's great served with rolls." Heat the oil in a large saucepan over medium high heat. Stir in the onion and garlic and saute for 5 minutes, or until tender. Then stir in the kielbasa and saute for 5 more minutes. Pour in the tomatoes, tomato sauce, salt and pepper to taste and the pasta. Mix all together well, making sure the mixture is wet enough to cook the pasta. If necessary, mix in some water. Cover, reduce heat to low and simmer for 20 minutes, or until the pasta is tender. The perfect, satisfying pasta dish for busy weeknights. This was easy but I did not like it. My mom and my husband loved it! I don't eat meat so I couldn't tell you how it was. I can tell you from the stand point of someone who hates to cook, it was simple and easy. Thanks!